One of the most exciting things about the festive season is getting dressed up for holiday parties and gatherings. Outfits in velvet and glitter notwithstanding, beauty is equally as important in creating a cohesive holiday look. Hairstylist Anissa Anthimiades from Akríveia Hair Lounge at MY SALON Suite at Gainey Ranch shows us how to create three flattering holiday hairstyles that will take you from the office holiday party to ringing in the New Year. – 1 &1/4 in barrel curling iron or curling rod preferably . Section out 1 inch wide by 2 inch thick sections and curl entire head by holding each section instead of clamping to hold. 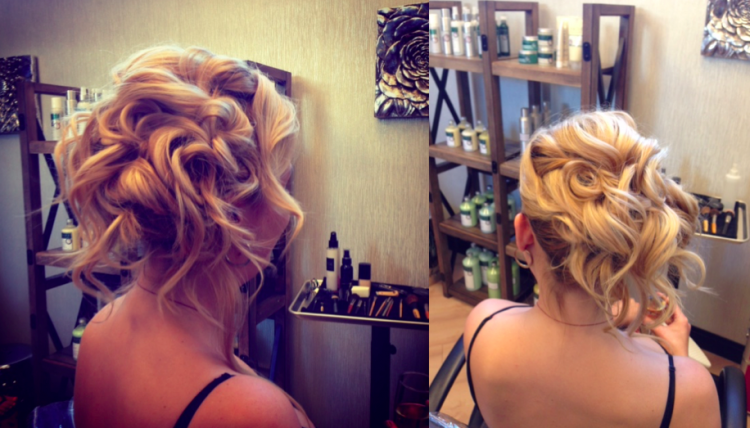 Spray each section before and after u curl.This is called a candle stick curl it gives more of a tousled romantic curl. Flip head upside down and massage scalp while gently shaking out the curls , no need to run fingers throw the curls if u shake enough. Spray again with hairspray before flipping head up again and spray with shine spray once u have. Section top hair from ear to ear and put out of the way. Secure a pony tail at ear height with remanding bottom half of hair. Take top hair down and tease the crown area of the head gently. Take 2 bobby pins and a small desired amount of hair from the top section and pin back creating somewhat of a puff for volume . Gently bring the pinned ends back with the rest of the top section to secure another ponytail just above the first . Final – take the rest of the bobby pins and loop and twist the curls while pinning them around the top of the top ponytail continuing around the sides and down beneath the bottom ponytail. Section from the bottom up 1in thick sections and break them up into 2 in pieces. Wrap hair around the barrel holding without clamping (Creates a more relaxed curl). Pull down slightly when releasing this also relaxes the curl. Continue through the entire head to the crown. Create a strong part left side or right side your preference. Spray generously throughout. Flip head over , gently shake out the curls using your hands. This completes a soft curl with volume that will last all day or night. Section from the bottom up 1in thick sections and break them up into 2 in pieces. Wrap hair around the barrel holding without clamping (Creates a more relaxed curl). Pull down slightly when releasing this also relaxes the curl. Continue through the entire head to the crown . Create a strong part left side or right side your preference . Spray generously throughout. Flip head over , gently shake out the curls using your hands. This completes a soft curl with volume that will last all night. Gently lift curls in the crown area and lightly tease without drizzling the curls. Blend out the tease so it settles into a natural looking structure. Section from the top of the ear and clip that out of the way . Roll and twist the bottom section towards the part side “where most of the hair lays” then pin tightly to that side and under the ear level. Take the top section and arrange at the ear level two in. sections at a time and pin in place continuing the side swoop and also leaving the volume at the crown area. MY SALON Suite is a deluxe suites salon space professional stylists can rent to help them start their own businesses. It is located at 7704 East Doubletree Ranch Rd, Suite 165, Scottsdale, Arizona 85258. Anissa specializes in precision hair design, air brushing makeup, couture styling for weddings, fashion shows & special events and extensions. To book an appointment with Anissa, please call 480-570-0416.